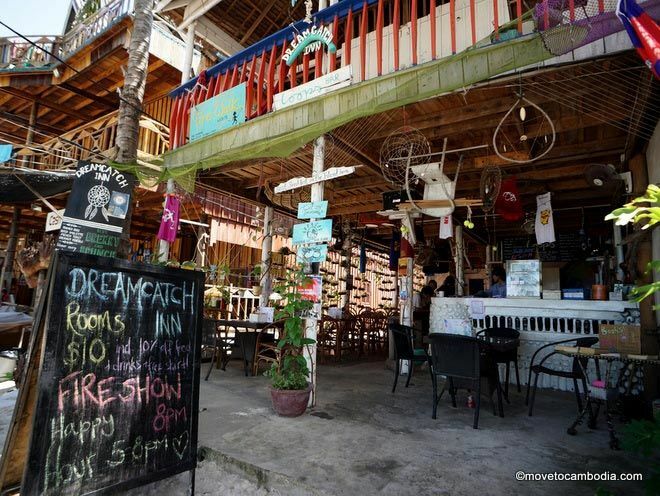 This low-priced, colorful hangout in the heart of Koh Toch has simple rooms with personality. Dreamcatch Inn is now closed! Check out our guide for other places to stay on Koh Rong. If you’re looking for cheap accommodation in Koh Toch Village, Dream Catch Inn has one of the best offerings in the inexpensive-hangout category. The place gives off a hippie collective vibe, but only in the best ways. They have weekly fire shows, a large collection of Native American dreamcatchers, muesli for breakfast, and at least a few good-natured backpackers hanging out at all times. A colorful hangout in the middle of the action. Dream Catch Inn strives to be eco-conscious and socially responsible and works with the Friends of Koh Rong on island sustainability and conservation issues. They also claim to have the best breakfast on Koh Rong, and while we can’t verify that for sure, we certainly had our best breakfast on the island there, in the form of Israeli eggs-and-tomato-sauce shakshuka. They also serve a range of classic English dishes, fresh juices and smoothies, and Cambodian curries. The bar has a happy hour from 5 to 8 p.m. with two-for-one mixed drinks and $2.50 cocktails. Which brings us to our next point — Koh Toch Village can be quite loud, and the rooms at Dream Catch Inn reverberate with sound when there’s a loud party in the village, which during high season is often. If you’re there to have a good time this won’t be a problem, but if you’re looking for peace and quiet, Dream Catch is probably not the place for you. One of the colorful rooms at Dream Catch Inn. The rooms are simple, and as in most of the other seafront village accommodations, many have no windows and get their light from on high — the walls don’t extend all the way to the ceiling, and there’s two-foot-high open space with cross-beams (to prevent midnight visitors) that lets in light and allows for air circulation. What’s nice about the rooms at Dream Catch Inn, compared to those of some of their neighbors, is that they’ve taken the time to spruce up the rooms a bit. They’re painted in bright colors; and the one we stayed in had festive Dia de Muerto murals and T.S. Eliot quotes inscribed on the walls. 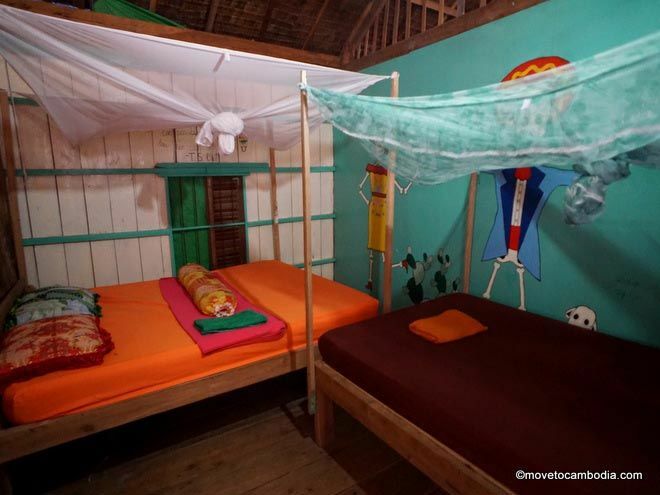 All of the rooms are fan-cooled and come with a mosquito net, and guests all get 10 percent off all food and drink as well as a free T-shirt. They have four rooms with a double bed and a single bed (be warned, it’s close quarters) and have a shared bathroom. There’s also one room with a double bed and a private bathroom. The prices fluctuate depending on the season and how busy the island is. At the time of writing reservations are available by Facebook or on a walk-in basis, but they are in the process of adding an online booking system.